First Tomik deck on Tappedout! Inspired by ToSGod's Brimaz taxes deck is my own Taxes style teck with the new Tomik, Distinguished Advokist. 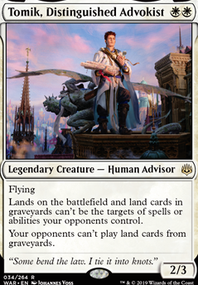 I already had a taxes stax deck built but he seems like a more fitting commander. I am moving towards a more Death-and-Taxes strategy. I also hope to pick up a foil Blackblade Reforged from the Gideon spell book because of that amazing new art! One notable combo I enjoy is Balancing Act + Teferi's Protection to cause my opponents to sacrifice everything and, if I am hellbent on resolution, discard their hand as well. Avacyn, Angel of Hope along with any Armageddon effect is also quite devastating. 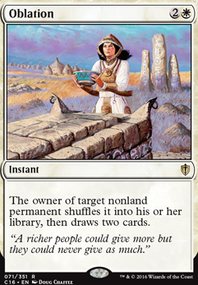 Land Tax + Scroll Rack is obligatory card advantage in white. Boreas Charger + Path to Exile is a once off combo that I have resorted to when behind in games before. Martyr's Bond along with my own land destruction lands cause my opponents to sacrifice their lands when I activate them AND I get to destroy another land as well if they don't sacrifice the targeted land. Tax effects such as Thorn of Amethyst and Glowrider as I have a large chunk of non-creature spells that I would prefer to cast without being hindered. Fall of the Thran is also excluded as Tomik does not stop the second ability sadly. Ravages of War is excluded simply because I do not currently own a copy. Any suggestions would be appreciated! Hello all! Four days ago you have made this deck #2 overall and I could not be happier! Also I have added some land destruction lands in place of some basics. I will also soon be trying out new Karn with a lattice and other stax effects in the side as well as the new Ugin because of his utility that he provides.